The Avengers have been Marvel's home to positive super-hero role models for generations. Well all that changes this December, as fifteen young heroes join my man of the 90's, Darkhawk, in Arcade's Murder World in the Avengers name, and well, fight to the death. Written by Dennis Hopeless and illustrated by artist Kev Walker, welcome to the new Marvel NOW! series; Avengers Arena. As Arcade tries to reclaim his former rep by creating Murder Worlds that actually live up to their name, Marvel hopes the series will give a House of Ideas touch to the teen vs teen deathmatch genre, an arena which has produced such classics as Lord of the Flies and current box office king The Hunger Games. Always in fear that Darkhawk will be forgotten amongst the Marvel character library, I'm stoked to see him appearing so early in the post Marvel NOW! world. 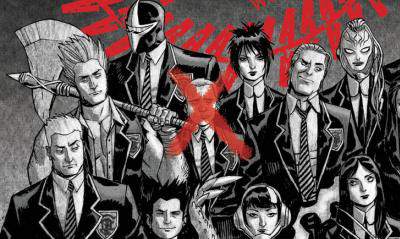 Joining Chris Powell in this game of survival is Annihilation's Cammi, plus Mettle, Hazmat, Reptil, X-23 and Juston and his Sentinel from Avengers Academy, Chase and Nico of Runaways fame, as well as the teased Braddock Academy - suggesting ties to Captain Britain, if not Psylocke as well. While I'll admit I'll be pretty dark if old DH bites the big one early on, the fact that the series will initially feature covers by Dave Johnson sure does provide even further incentive to buy. Get the full scope, check out the full story at Marvel.com. 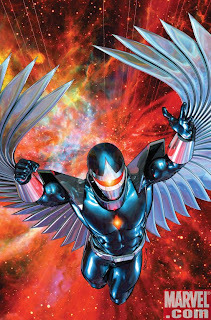 Well I guess it was only a matter of time before Marvel decided to cash in on the Hunger Games craze, but hey like you said, at least Darkhawk's getting some love again. I hope he makes it to the final 4. I mean he should since he has more experience than all of the other kids combined. That is true on all counts Dale - and he's pretty much got the powers thing nailed too! Now, I'm all for pulling Darkhawk out of the closet and dusting him off. Goodness knows he could use a little time in the spotlight. And I love the idea of pulling in some of the cast of the Runaways, since I miss that comic like nobody's business. But I seriously hope they don't just start killing off kids left and right. See, this is why I subscribe to your blog :). I love that you introduce the series as Darkhawk and 15 other young heroes! I'm not so sure this is the right way to put him back in the spotlight, but I am always an optimist when it comes to tales with Darkhawk. The fact that "many will die" is off-putting... not so much because "many will die" but because that's obviously not reasonable from an intellectual property perspective :). Many of the cast have either just been introduced to Marvel in the last few years (Avengers Academy), or still have strong cult followings with fans demanding their return to the spotlight (Runaways and Darkhawk in particular). Having a series that turns any of these young heroes into murderers seems counter-intuitive to building them up as role models for new readers. Finally, Darkhawk is the oldest of the bunch (Kev Walker stated that age ranges from 12 to mid-20s) and without any doubts has the most experience as a fighter (and evader). Making him a killer would defeat 20 years of continuity of him struggling against the darkness within him. Only time will tell where this series goes! It's a series afterall... not a mini-series! Random - you bring up the exact reason why I'm surprised the Avengers brand is on it. Worlds Mightiest Teen Killers just doesnt seem right. Still Marvel was under a lot of pressure to get Runaways running again, so I'd say many eyes will be putting the actions of this book under a pretty tight microscope! PS if you liked Runaways you will LOVE Saga from Image by B.K.V. It might just be my favourite book of all. NunoXEI - and this is why I dig having you sub to IADW! It's great having the net's biggest Darkhawk fan down from myself of course on the list. I mean Chris decided on the killing thing pretty early in the piece after Punisher Venom and the death of Dr Vonya, unless War of the Kings sent his mind loopier than Lodestone, he should still maintain those values. But hey - even in Lord of the Flies - which is highly superior to Hunger Games - there is a pacifist team holding out for hope. Who's to say that's not happening here? Okay, writing that name down. Dang, I really need to get to the comic shop. I'm starting to think about mail subscriptions. Or starting a comic shop myself just so I don't have to drive out of town to buy the darn things. Thanks Dan! And THANK YOU for pointing out that the Hunger Games is not the first time this subject has ever been written, or even the best. All it really did was make it accessible to younger kids, and honestly I have a hard time with that. I think I'm the only mom of my kids age groups (10-12) who won't let my girls read the books. And it's not exactly because of the violence, which I think should always be taken on a case by case basis, but because of the way in which the violence is perpetrated, and because of the lack of any kind of hope or decency inherent in almost any of the characters. Save maybe one. Honestly, I'd rather they read Lord of the Flies first. In about four years. After they've gotten through the Hobbit and Lord of the Rings. Get a good grasp of Nobility and Self Sacrifice under their belts before tackling horrific stuff like that. Back to topic, though. I really think, assembling a group of even younger heroes, you're going to get a bunch that will stand up and say, "No." And if the writers don't do that, they're severely misinterpreting their characters. Saga is amazing. No one does dialouge like Brian does, and his couple (recently with child) speak and talk like a real couple does, even though they are being chased by bounty hunters on alien worlds, and their baby has a guardian spirit who looks half eaten, but like Death is pretty friendly too boot. Trust me, it's golden. I agree re what difference hope make in the characters too. Its the same in comics. and most noticeably in the Punisher. Punisher who shoots a room full of mafia may sell 100,000 copies by a lazy writer but it's completely devoid of character. What makes Frank tick for me is his hope of seeing his family again and protecting people going through the same thing he did. When writers ignore that for the hard shell shootin Frank they are not only missing the boat, they are sending the wrong signals to readers about ethics as well. Lord of the Flies spooked me as a kid. I loved reading because you could visualise your own world or version. And one pivotal death in the book just had me wishing the pages had stuck together, or I'd read it earlier in the day. But yeah that'll probably get a Hollywood remake soon too. I mean teenage cannibals aren't that far off teenage vampires are they? Just so long as they don't make them sparkle.